My topic for day twenty nine, with only three days to go until our journey together is over, is the only one given to me by someone I don’t know personally! To Donia’s boyfriend, thank you for keeping the positivity in this tale! Anagrams and attitudes. J R Manawa. Inside the box, there was a roll of paper. Inside the roll of paper there were pieces of ash and pohutukawa flowers. Eleven years ago, her father had intended to remind her of the events that happened when she was four, of all the strength that she had inside her and all the things she was capable of, by giving her the ash of a teddy bear. Her mother had looked instead to remind her of who she was, a child playing and loving carefree in the shelter of the pohutukawa trees that grew up big and strong on the edges of the cliff, with roots that ran deep and branches that stood tall. The roll of paper was a birthday message, the one she had been meant to receive the night they disappeared forever. Emmeline, Happy Birthday. With all our love, remember who you are. She cried, and this time it was Charon who held her. When she was done, she closed the wish box and tucked it into her pocket. Charon wiped the tears from her eyes himself. “One day you’ll have reason to stop crying,” he promised. Not to be outdone, Thomas gave her another hug too. “You knew what this was all along, didn’t you?” Emmeline said to Charon. Charon glared at him, “Melek will not be found until he wants to be found,” he said to Emmeline. “We will go to the mansion,” she replied, resolutely. Emmeline nodded sullenly, and picked up Gulliver’s note again. “I have to go and see someone.” Charon said suddenly. Thomas looked from Emmeline to Charon and back again, listening to the conversation mutely. “I’m not asking you to come. It would not be safe for you this time,” he said. When he left Emmeline watched him go from the doorway, and after he disappeared from sight, she turned to glare at the crows who had gathered on the fence once more, straddling the shards of the broken pot with their ungainly black claws. Finally she closed the door on them. She was beside herself with anxiety by the time dusk arrived. She and Thomas had spent the day sitting in her room, because it was the only room in the house that didn’t feel miserable and empty. Thomas watched mindless daytime television shows, while Emmeline stared blankly at the screen. Night eventually fell, and Emmeline began to pace in front of her bedroom window. She couldn’t even manage more than a few bites of the pizza Thomas had ordered. Ignoring Thomas completely, she took to obsessing over Gulliver’s note, sitting on her bedroom floor with a notebook and a pen. “Do you remember what he said about being positive?” Thomas said suddenly, turning off her television and looking down at her worriedly when he realised she had covered the floor with balls of scrunched up paper in less than an hour. Emmeline snapped her head up. She nodded and put her pen down, holding the paper up to him. “What do you see?” she asked him, excitedly. “And what about now?” she covered over the words ‘for us’ that came after the comma. 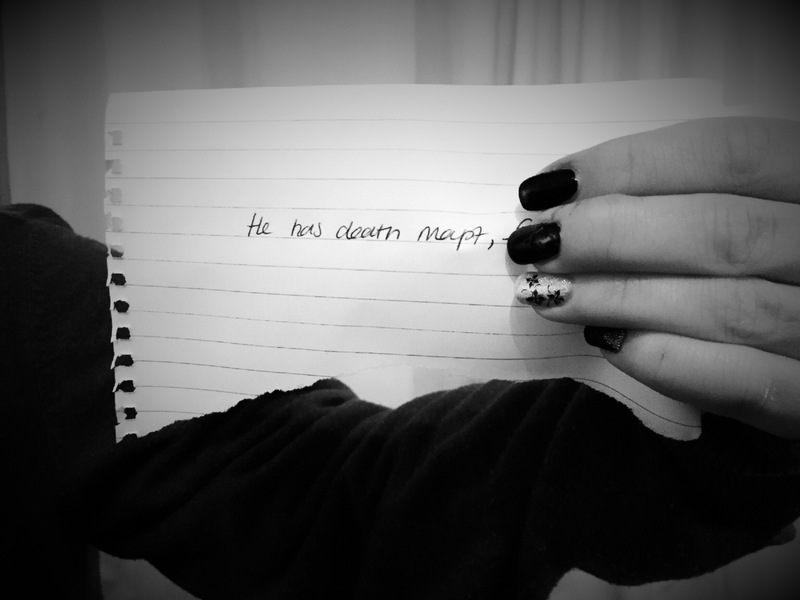 He has death mapt. “A spelling mistake,” he pointed out dryly. Emmeline nodded avidly, “A location.” she passed Thomas one of the many pieces of paper she had been scribbling on. Thomas snatched the piece of paper from her hands and sat up straight, “Too clever for his own good,” he muttered. Emmeline nodded, the words Gulliver used before the comma were an anagram for ‘Hampstead Heath’.